General Ulysses S. Grant took rooms at the St. Denis Hotel after the Civil War so he could quietly work on his memoirs. The general, however, quickly developed writer’s block and his work came to a standstill. 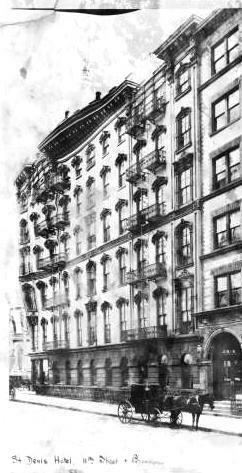 Mark Twain, whose company had contracted to publish the book, immediately traveled to New York and took a room at the hotel for more than three months. The project was saved. 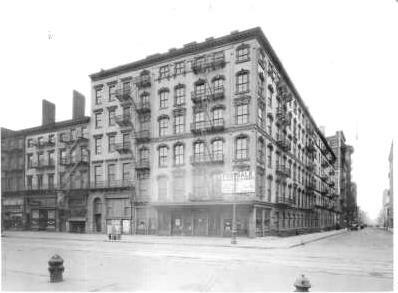 The comfortable hotel on the corner of Broadway and East 11th Street where Twain and Grant worked on the manuscript was already famous. Opened in June of 1853 it was designed by architect James Renwick whose family owned the property. Renwick was responsible for the magnificent Grace Church directly across the street. When Sarah Bernhardt visited New York on her first American tour, she stayed here, as did P.T. Barnum, Colonel William “Buffalo Bill “Cody and Chester A. Arthur. Here Alexander Graham Bell gave his first New York demonstration of the new telephone in 1877. The hotel got its name from the original proprietor, Denis Julian, who had for years run a famous restaurant on Washington Place known as Julian’s. The land on which it was built had been part of the Brevoort estate for two centuries and became Renwick property as the families merged through marriage. The first-class accommodations included $52,000 in furnishings. And so it was with the St. Denis. Well-dressed and seemingly reputable guests would sometimes check in with the express purpose of larceny. Similarly, in 1905 police arrested Alice Lansen who went under the name of the Baroness de Vorte Salmo for grand larceny. Lansen had in her possession two jeweled fans and “considerable clothing” worth $800 which was the property of Mrs. William Slater of Washington, DC. Lansen’s husband was humiliated and told a New York Times reporter he was considering suicide over the publicity. Police officials were, apparently, unmoved. 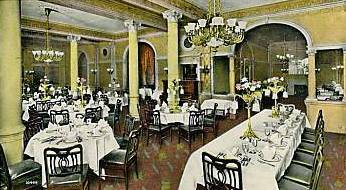 In 1891 the hotel was enlarged "by a new and handsome addition which more than doubles it former capacity," and the "latest improvements" were installed. Among the upgrades was a system of fire gongs that were rung to alert sleeping guests of danger. While still owned by the Renwick family, the hotel was managed by William Taylor and his son from 1875 to 1912. Then, on March 16, 1912 the St. Denis Hotel Company was organized to take it over. The new group spent $52,000 in improvements and new furniture, bringing the hotel in line with the latest Edwardian styles. The syndicate signed a ten-year lease at $4,000 a month. It would be the beginning of the end of the historic hotel. Within a year the company filed for bankruptcy, owing $4,000 in back rent. Counsel for the creditors explained that, although there were many resident guests, the northward movement of the entertainment and shopping districts was hurting business. 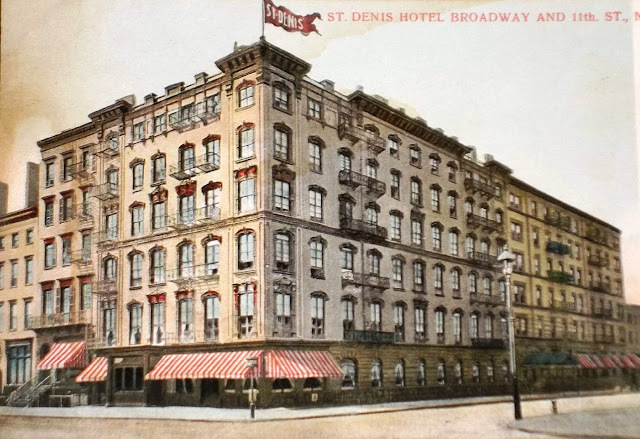 On February 11, 1920 the Renwick family finally sold the St. Denis Hotel at auction. A syndicate headed by Garfield Moses, Ely Bernays and Joseph M. Brody purchased the building and announced it would be demolished for an office building. Instead, however, the group renovated the St. Denis, stripping off Renwick’s decorative window treatments and leaving a bland, flat-surfaced cube. 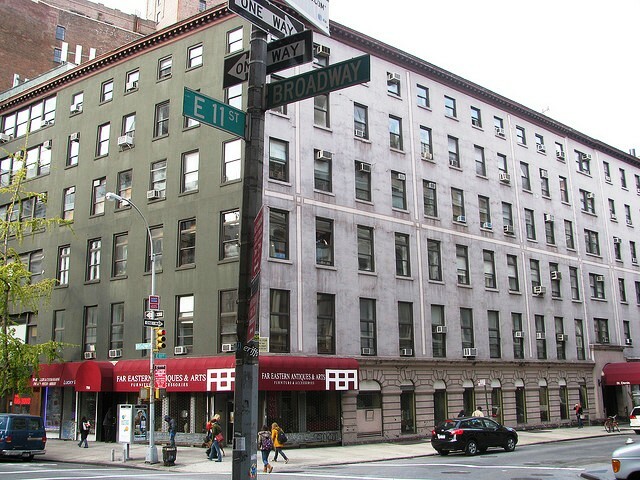 A second entrance was installed on the Broadway side and the first floor was gutted for retail spaces, four on Broadway and three on 11th Street. 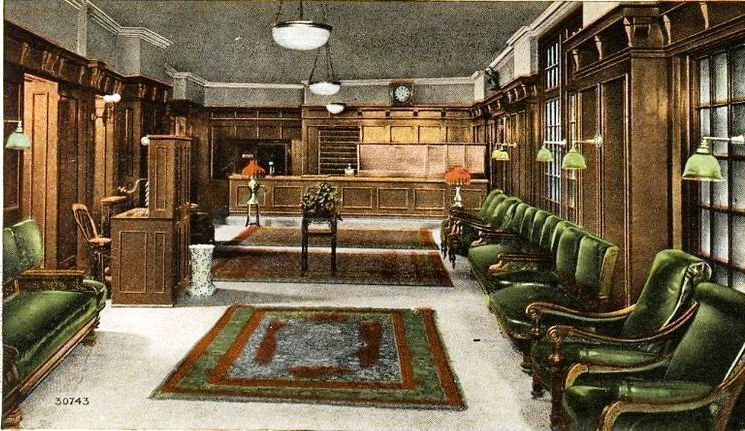 The grand dining rooms and reception areas were demolished for non-descript offices. Today no passerby could imagine the history or importance of the once-magnificent structure on the corner of East 11th Street and Broadway. A purely featureless structure, its colorful history is largely forgotten. No hint of the former hotel's glory days remains. May I ask the source of the assertion that Grant and Mark Twain rented rooms so that they could work on his Personal memoirs? And the absurd comment that Grant had writer's block also goes beyond the pale. The man began his Memoirs in Long Branch, NJ, wrote the bulk at his home in NY City and finished 4 days before his death at Mt. McGregor, NY. And he was dying of throat cancer during this period. Writer's block? Please do some serious research before venturing into areas that you know nothing about. Why the rancor, Mr. Underhill? Perhaps the Friends of the Cottage --and the public -- would be better served by an amiable, informative response. Yours does no good for anybody and sullies the image of your organization. What a great little article - even despite the error of an unsalaried, untitled author. What a nasty, snappish reaction from Mr. Underhill. It does not honor the gentle, understanding good man that was Grant. I understand your consternation. Imagine someone suggesting Grant having "writer's block"??? The gall! As we all know, Miss Underhill, Grant was a perfect human. Thank you. This article from The New York Times dated July 1, 1917, supports my comments. Although it's been more than six years since I commented on your article, Mr. Miller, here is my response to your comments and the NY Times article of July 1, 1917. The writer of the NY Times article is nameless. Even if we knew the writer's name, it wouldn't help us to find the source of his assertion that Grant wrote his Memoirs at the hotel . I would surmise that he heard it from someone who heard it from someone else. As for Mark Twain staying at the St. Denis, of that I have no knowledge. I would recommend the following books on Grant's last days and the writing of his Memoirs. All are very well written. "Grant's Final Victory" by Charles Bracelet Flood (2011), "Grant's Last Battle" by Chris Mackowski (2015), "The Captain Departs "by Thomas M. Pitkin (1973) and "Many Are the Hearts: The Agony and the Triumph of Ulysses S. Grant" by Richard Goldhurst (1973). Not one author mentions the St Denis Hotel or that Grant had writer's block. Perhaps I should have been more diplomatic in my comments on your article, but yours was not the first to err about Grant's writing of his Memoirs. I think we need to give this one to Miss Underhill, (there seems to be something personally offensive to Miss Underhill about this concept) otherwise she may begin to weep uncontrollably, and even spoil her garments! Either way, it's clear she's not letting this one go. Even though the evidence for him having stayed there is strong. This site rocks. Really useful info thanks. Is there any truth to the story that President Lincoln stayed at the St. Denis when he came to make his Cooper Union address? I could find no documentation for that, and Lincoln typically stayed at the Astor House Hotel further south on Broadway. There have been reports at The St. Denis of a ghost that looks like President Lincoln. The Abraham Lincoln Brigade Archive Office is on the third floor of The St. Denis as of 4/6/2016. Mrs. Lincoln stayed at the St. Denis Hotel In September of 1867. According to her seamstress and close companion, Elizabeth Keckley, she and Mrs. Lincoln stayed in the hotel when Mrs. Lincoln went to New York to sell her clothing as she was in need of money. In her memoirs titled Behind the Scenes (1868), Keckley says Mrs. Lincoln registered under the name Mrs. Clarke; she did not want anyone to know she was selling her clothes. I am reading those memoirs now. Mrs. Lincoln and Elizabeth Keckley stayed at the St. Denis Hotel for only one night, on account of the staff treating them poorly. They would not let Elizabeth eat in the dining room. I think it is worth noting that the building once housed the legendary Gnome Press, publisher of much of what is now considered classic science fiction. What a beautiful place to have had an office. My dogs, Pogo and Grady, and I spent many wonderful years there. A special thanks should go to Robert Pappas, long-time manager of the St Denis, for renting me the space in 2003 and for being a great manager of the building. Just as occurred in 1917 (almost 100 years ago! ), I hope it survives the latest change in ownership. What a terrific post; all former, and the few remaining present tenants, should read this. I moved my law office here in 2003 with my two dachshund dogs, Pogo and Grady, who were then five years old. Down the hall was my close friend who also had two dachshunds, so there were four altogether within close proximity. I will be leaving by the end of this month with my wonderful dog and paralegal Pogo who is still with me as he approaches age 20 (lost Grady a few years ago). I will miss this beautiful building forever.